Recent news articles highlight the struggle for affordable housing for teachers in San Francisco – and announcements of the Mayor’s commitment to teacher housing and child care for children who are homeless. How do these stories and announcements relate to ECE teacher experiences, and the work the ECE community is doing to gain additional resources? The San Francisco Chronicle featured a SFUSD Math teacher and her struggle to find housing she could afford. This article sparked renewed interest from the Mayor’s Office, as he has now pledged $44 million to the construction of teacher housing. Do our legislators know that ECE providers are teachers and are at risk too? The Child Care Planning and Advisory Council (CPAC) compiled information on ECE provider salaries in SF pertinent to this conversation: Average pay for an ECE teacher in San Francisco is $35,000, a little over half the average pay of an SFUSD teacher (the average pay for an SFUSD teacher is around $65,000 per year). Let’s make sure our legislators know, and join with public school teachers and other priority occupations to get the needed assistance. With budget season at its height at the local and state level, it is an important time for the ECE community to continue pushing for increased funds to build and maintain a stable workforce of educators ready to provide early care and education to San Francisco’s children. What can you do? Join us at the Friday, June 2 ECE Issues Luncheon. The luncheon is an opportunity to engage with community and elected leaders about the issues in the early care and education field, including issues like affordable housing and increased resources for ECE in the state and local budget. Register here! Make sure that our SF community and leaders are aware of ECE needs – share your stories. Does tenuous or overcrowded housing or homelessness impact you, your colleagues, or staff? Are you able to attract enough teachers to provide care and education for additional children? How far can San Francisco’s early care and education programs expand without more funds to support teacher compensation? Please email me at sara@ecesf.org. We will work with you to get ECE news in the media and before our legislators. Watch for more emails to build a media campaign! See excerpts from San Francisco Chronicle articles on teacher-housing and the Mayor announcements below, with links to the full pieces. “In fact, a new report by Apartment List, an online listing of apartments for rent grouped by location, shows that San Francisco’s teachers have it not only the worst in the state, but the worst in the entire country. Most people become more financially secure as they advance in their careers. San Francisco’s teachers, it turns out, actually have it worse, unless they want to live with a roommate, college-style, forever. A rookie teacher in the city makes $4,473 per month. That teacher has to spend 51 percent of his or her income before taxes to rent half of a two-bedroom apartment, sharing it with a roommate, the Apartment List report concludes. But let’s say that by a teacher’s fifth year on the job, living with a roommate is getting old. 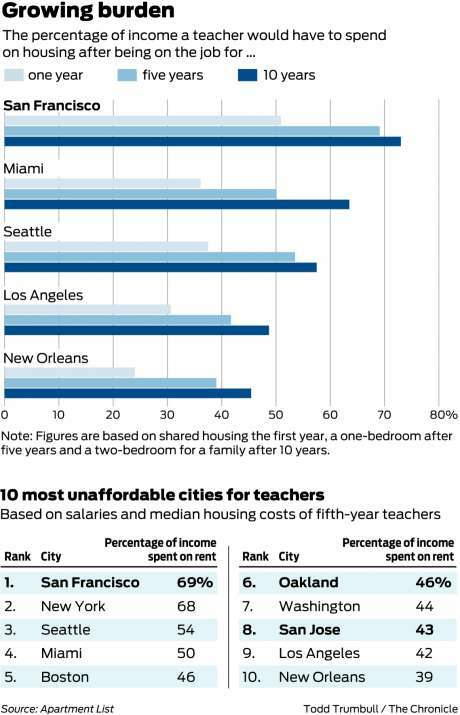 Living solo in a one-bedroom San Francisco apartment will eat up 69 percent of the teacher’s income. And 10 years into the job, if our teacher wants to really spread out in a palatial two-bedroom apartment with a spouse and kids? The price tag will be 73 percent of the paycheck. “In consultation with Olson Lee, his director of the Mayor’s Office of Housing, Ed Lee has picked a site for teacher housing: the Francis Scott Key Annex at 1360 43rd Ave. in the Outer Sunset. He said he will commit $44 million in city money to build 130 to 150 rental units of teacher housing and will seek a developer as soon as possible. Lee’s new commitment could begin to address this problem. He acknowledged that it will need the buy-in of the school district and an affirmative vote from the Board of Education to move forward. The Board of Supervisors does not need to approve the expenditure because the money will come from the Housing Trust Fund, which is used for a variety of projects. The working group, composed of officials from the school district, teachers union and mayor’s office, has been stuck philosophizing about how units will be doled out, but Lee wants to start the building process while those discussions continue. Questions about how teachers will qualify for a unit and what happens if they resign or retire are still being ironed out. See the full News Update here.